Hey there shoppers, here's another big garage sale coming up soon : It's the Cainta Grand Garage Sale, wherein second-hand goods such as used clothes, books, furniture and more will be on sale. 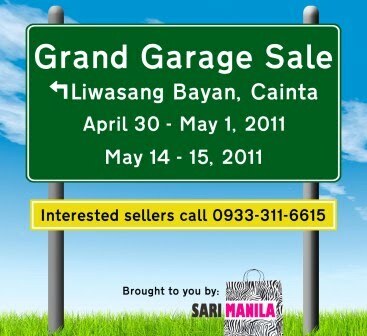 FOR INTERESTED SELLERS, PLEASE CONTACT 0933.311.6615. HURRY, LIMITED SLOTS ONLY! RESERVE NOW!